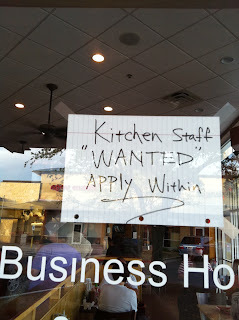 The “Blog” of “Unnecessary” Quotation Marks: Staff "tolerated"
I guess they don't actually want new staff, but they're hiring anyway. Thanks, LPT. They are probably preparing for the new tax incentives for hiring new workers. OR.... they made the FBI list. Recently, the entire kitchen staff at a San Francisco Fisherman's Wharf walked out on a Saturday night in protest. I wonder if this sign is posted at that restaurant?